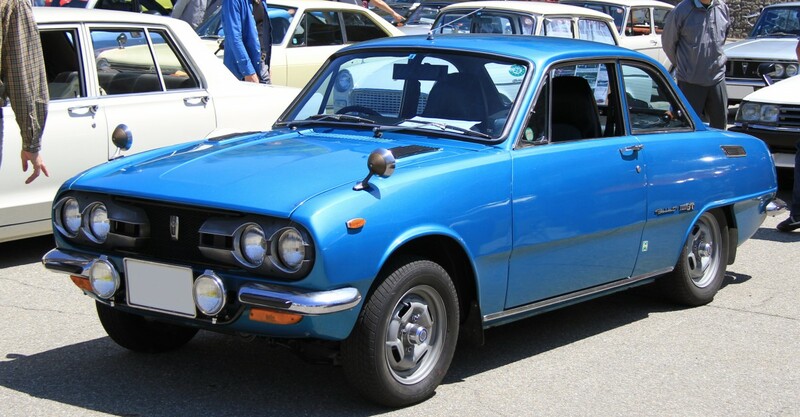 Isuzu Motors Ltd. was in rough shape in the late 1960s and early 1970s. The Japanese maker of heavy duty commercial vehicles, with a side foray in passenger cars, was a bit player on the Japanese automotive scene and was under intense pressure to merge with a larger entity. But that didn’t stop the company from dreaming big, and one of those dreams, though flawed in many ways, was the Isuzu 117 Coupe. Styled by famed Italian designer Giorgetto Giugiaro, this sleek sports coupe was a Japanese take on a European exotic. 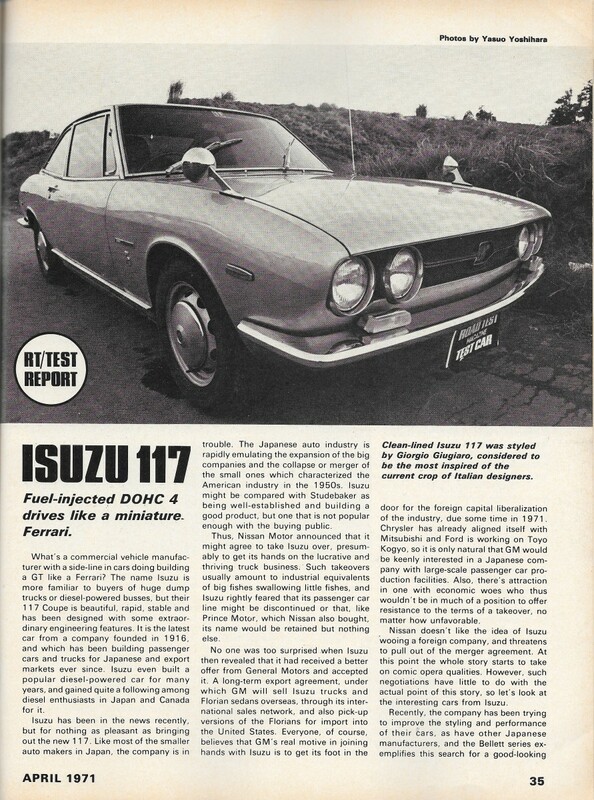 Though the 117 would never be sold directly in the U.S., Road Test Magazine’s Tokyo correspondent took the Japanese/Italian quasi-exotic out for a comprehensive road test as reported in the April 1971 issue. From the company’s inception, Isuzu’s cars had not been standout styling stars. They tried sporty with the Bellett 1600 GTR, which was decent enough, though far from an Italian super model. However, when asked what an Isuzu looked like, most Japanese would have conjured up the frumpy Florian. The dreamers in Tokyo weren’t deterred–they used the Florian chassis as the basis for a styling fling with the Italian design house. Who says a bottom-tier Japanese industrial corporation can’t dance with the stars? The Saké also must have been at work when the Road Test driver couldn’t tell if the walnut trim on the instrument panel was real or fake. As for the car itself? Well, it was a flawed beauty to say the least. It wasn’t really that quick, allusions to Ferrari power plants aside. Braking feel was subpar, and both the manual shift action and the manual steering were heavy and hard to use. A true super car needs a lot more than just great looks. But, just as with the Giurgiaro-styled Piazza/Impulse that would ultimately replace the 117, at least Isuzu had a flair for the dramatic–even if all the style was just draped over a mundane platform. Sweet looking car. I’ve seen pictures of these cars, but for some reason, they were never sold here in the USA, so I’ve never seen an Isuzu 117. Nor have I seen a Florian, or Bellett. Once again my styling sensibilities don’t match most other folks. I find the plain Florian better looking than this. That huge rear glass and fastback shape just don’t jive with me. Of course I’m the one who thinks Avanti’s are ugly. Most folks don’t. To each their own I guess. I happen to agree with you. I don’t think the Florian is frumpy at all. Not really finding the 117’s styling to be to my taste either, though the interior is fab and some engineering touches like the neat fuel injection system are pretty advanced for their day. Good article. Had no idea that these existed. The lines, design, interior and engine are all really top notch, but looking at the performance–considering that it’s a DOHC with a pretty high compression ratio, including fuel injection and a very efficient hp to CID ratio and the car being a lightweight car–even for that time, it’s disappointing. I would have thought that it would have been 0-60 from 8-10 seconds, and 1/4 mile in 15-16 seconds. Or did they just have slower watches back then? (ha ha) Still, it would be cool to own one. 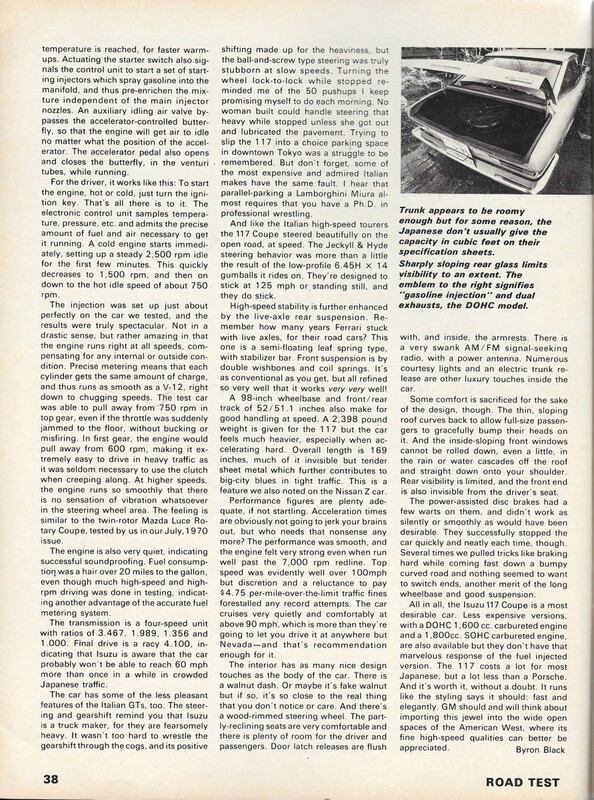 Those performance numbers are about what one would expect for the time back then, given that it had only 1.6 L, and weighed 2400 lbs, which was not particularly light for the times. A VW Golf/Rabbit weighed significantly less (about 1700 lbs). 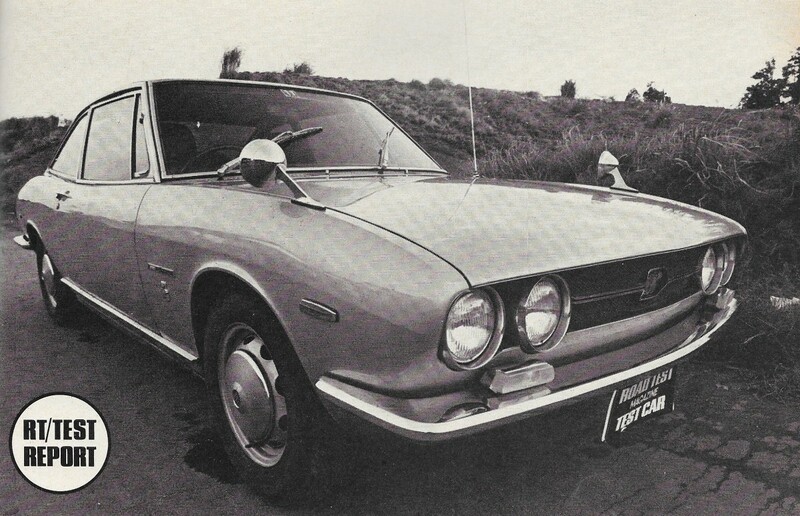 This coupe would have been roughly comparable to a Fiat 124 coupe in size and power, but the Fiat still weighed a bit less. The 117 was not a light weight. Four cylinder cars simply did not run 15-16 second 1/4 miles back then, unless they were exceptionally powerful and light. That was the domain of American muscle cars, mostly, and cars like a Porsche 911. When I was in Japan, in the Navy, in the early 80s, there was a house on or near the Navy base that had 2 Florians: a sedan and a wagon. What isn’t obvious in this picture is that the Florian, from the windshield forward, is identical to an 70s Chevy LUV pickup truck. The wagon, IIRC, has a odd looking reverse slant to the tailgate. Later Florians adopted the “trendy” waterfall-like grille that many small cars used when their styling was long-in-the-tooth. And considering how long the Florian was in production (1969-1983), it REALLY was long-in-the-tooth by the late 70s. 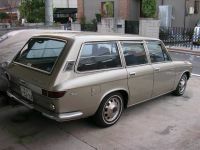 Wagon looks conventional enough – bar the sedan’s vertical C-pillar remaining. GM during that era only decided to import the Isuzu based Chevrolet LUV Pickup Truck because no American car companies had ever built the smallest light truck back then which later opened the market for slightly larger compact pick-up trucks like the Chevrolet S-10 and GMC S-15 in the early 1980s. GM also does not feel that it was necessary for them to import Isuzu made cars because Opel was primarily already doing the job for them. 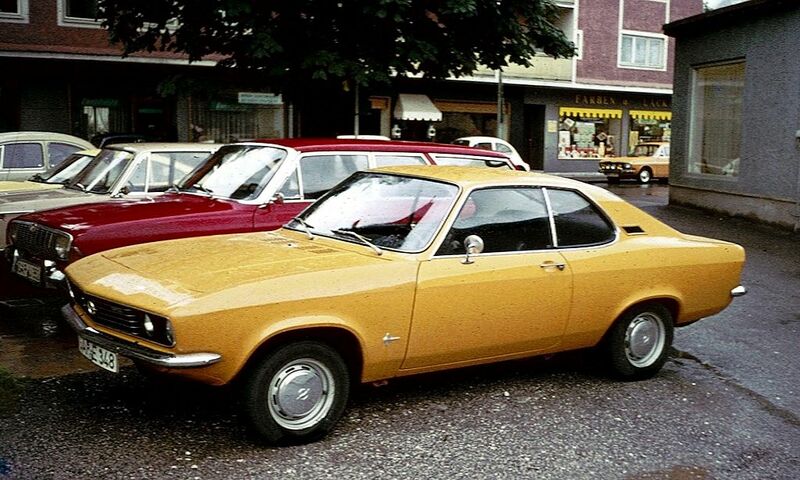 The Opel Manta was imported here from West Germany (as the country were known back then) and its size was identical to the Isuzu 117 coupe. 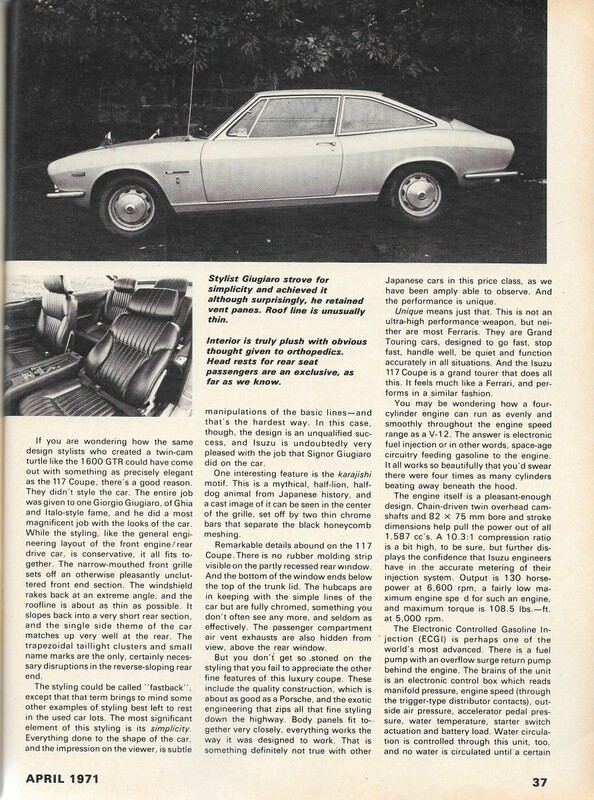 In addition, the ill-fated GM Domestic made Chevrolet Vega which was also identical in size with the Isuzu 117 had already entered the market as well. 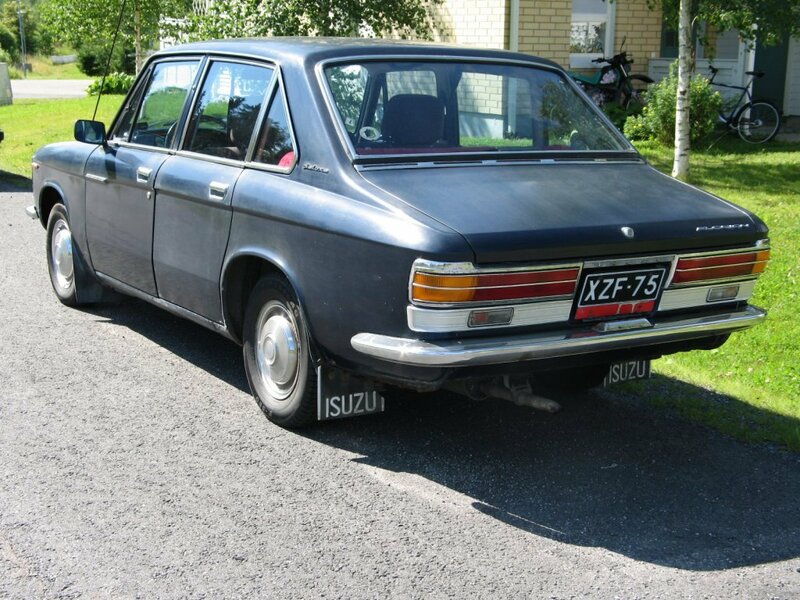 The Isuzu I-Mark was sold in the US starting in 1976 as the Opel Isuzu, replacing the genuine Opels. YES and the same Buick Opel Isuzu which came in many name variations such as the Isuzu Gemini, Isuzu I-Mark, and yes even a Chevrolet Chevette in other countries formed as the basis for the United States Chevrolet Chevette. 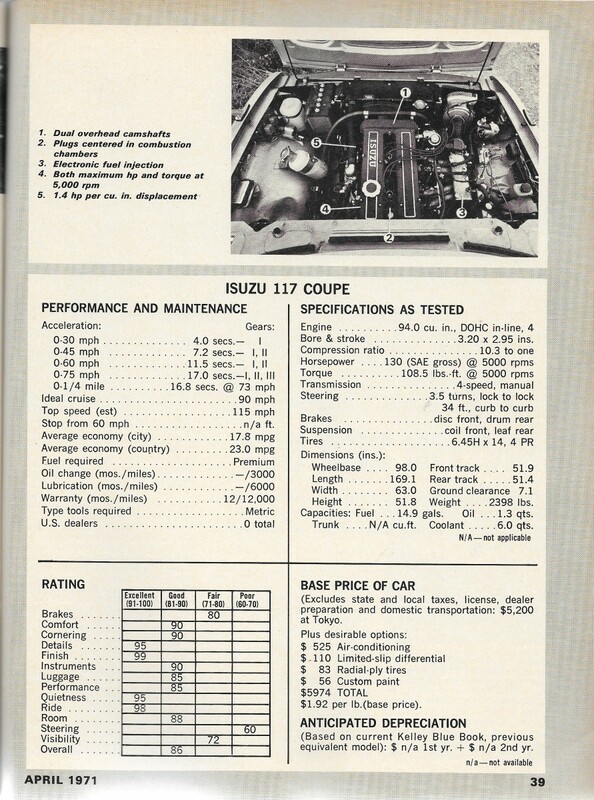 It surprising that the Isuzu Piazza or Impulse ( the Isuzu 117 replacement) in essence was based from a slightly longer Isuzu Gemini and our Chevrolet Chevette’s chassis. As I mentioned in my earlier comment, the Florian was/is not that attractive a car. Even in Japan it wasn’t a big seller, so why would GM in the US want to go to the trouble to federalize an also-ran sedan? The Opel by Isuzu wasn’t a great seller, either, but was probably chosen to be imported due to most of the engineering for it having been done already by Chevrolet. Probably one of the reasons why the Opel by Isuzu was not a big sales hit is that it made a mockery of the Opel name. PRETTY both inside and out! Isuzu should have invaded America with this instead of those strange Bellel diesels. The shape mixes curves and facets in a way that I haven’t seen before. It seems to have a crystalline structure. Great-looking car, and I think it would have sold–how many cars that have average or subpar driving dynamics have been saved by a pretty face? Quite a few. The irony is that the Florian and 117 came out of Ghia at the same time. I have the sneaking suspicion Giugiaro did the Florian as well, but might have been suffering food poisoning that day. The Florian looks a bit like the Mazda Luce of the mid 60s, a design by Bertone that was originally intended to be an Alfa Romeo….but was turned down. I was surprised when I saw the Florian and Ghia mentioned in the same “breath”. The coupe? That definitely looks Italian, the sedan? Not so much without knowing about the almost Alfa but ultimately Mazda Luce. Warning: it’s a pretty long piece but I needed a lot of backstory to address the Alfa rumours. Something hinky is going on with the claimed power curve. HP and torque peak at the same RPM? Only with a rev limiter at 5,252 RPM, and then the HP peak and torque peak would be the same number, as in X rpm and X ft-lbs @ 5,252 RPM. HP=(torque*RPM)/5,252 so there is no way to have more horsepower than torque at only 5,000 RPM, since there is no way of measuring HP. It is simply torque times engine speed divided by a constant. My former father-in-law had one, back in the day. He was a bit of a questionable business man, I think, so I associate these with Japanese flash trash! I saw one in Adelaide around 2002. 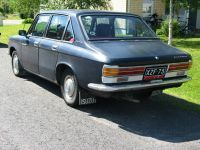 It was a later series with the rectangular headlights and rubbered bumpers in a dried blood colour. I managed to have a conversation with the woman who was driving it; her husband worked at GMH and apparently ten 117s were brought in to the country for appraisal as part of the Gemini program. I think I saw the same one around Nth Adelaide when I lived there a few years later, it was pretty tired looking by then. My ex pointed it out in a classic ” Dad had one of those!” moment. That’s where I saw it, but I have the feeling we’ve discussed this before. I caught a few round-headlight versions at a recent JDM showday, but I’m wondering whether your xFIL’s was one of the GMH cars. Nah, he lived in Yokohama so it was a local JDM car. I think we did chat about this before. I always thought of this as the Japanese equivalent of the BMW 02 Series cars, or perhaps the Alfa Romeo GT Junior, GTV, or Fiat 124 coupe. Not bad. An interesting look at an interesting car, thank you GN. 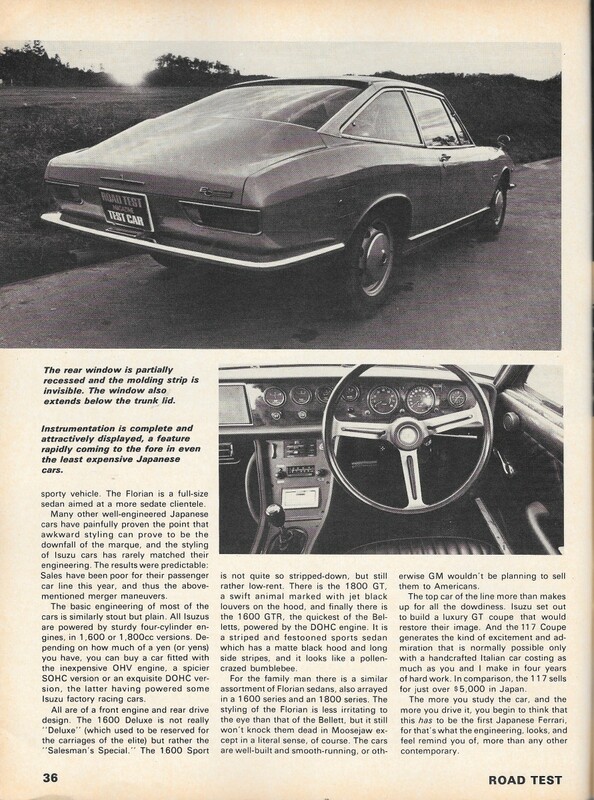 The 117 coupe looks like a Fiat Dino coupe to me, but I’m more interested in the Florian sedan, because it looks like a Chevy LUV in front and a Saab 99 in the back! Cool combo! Giugiaro shaped both the 117 (for Ghia) and Dino (for Bertone). Florian’s front clip is the same as the LUV’s. Good call on the Saab thing. Thank you for the explanation Don! I love the Bertone Dino, and of course the Saab 99 too, but I’ve also always loved the looks of the Chevy LUV! 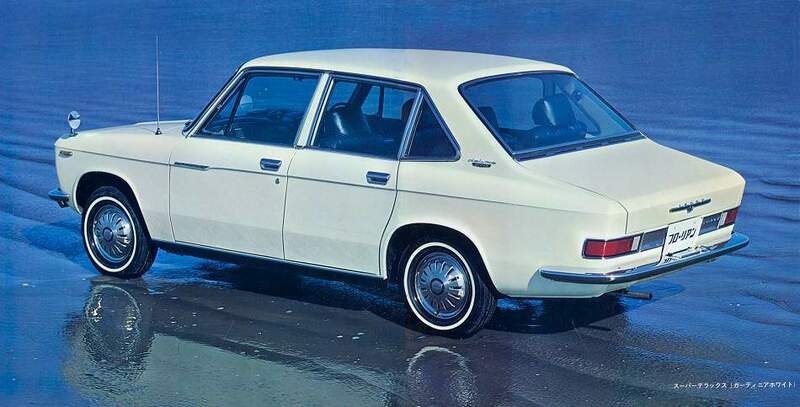 Check out how Saab-eque the Florian became in later years!